Napa Valley Holistic Veterinary Services-Healthy Treats for Happy Pets! Healthy Treats for Happy Pets! As a holistic veterinarian I am constantly asked “What treats should I feed my pet?” We used to be taught that human food was bad for dogs and we shouldn’t feed it to them. Well that couldn’t be further from the truth! Let me explain. It is extremely important that your pet eat a complete and balanced base diet, either designed and specifically balanced for long-term feeding or homemade and balanced with the help of your veterinarian or a veterinary nutritionist. Treats, however, can comprise up to 10% of your pet’s total calories for the day and you can have fun with them! Hippocrates said “Let food be thy medicine and medicine be thy food”. When you look at the food you most commonly feed your pet, you will usually find meat and carbohydrates as the main ingredients. What the food is missing is fresh fruit and vegetables! This is what I encourage people to feed as treats! Fresh fruit and vegetables are full of antioxidants and micronutrients that help protect against cancer and autoimmune disease, two of the most common and serious medical conditions that ail our furry friends. So if your pet will eat fruits and veggies then this is what you should feed as treats! Veggies should always be lightly cooked, because they will be better digested by our dogs and cats who are used to eating plant material partially digested in their prey. There are a few fruits/veggies you should NEVER feed to your pet including grapes, raisins and onions. Garlic is ok in dogs in small amounts but you should discuss first with your veterinarian. And I never feed garlic to cats. Something else to consider is the energetic property of the food you feed. In Traditional Chinese Medicine foods can be “hot”, “cold” or “neutral”. You wouldn’t want to feed a “hot” food in the heat of the summer or a “cold” food in the middle of winter. So you should refer to this handy food energetic chart when you are choosing what treats to feed. Great cooling treats for summer include watermelon, cucumber, spinach, kiwi, orange, mushroom, apples, blueberries and bananas. Watermelon is a great cooling treat for your dog to help beat the summer heat! Great warming treats for winter include cherries, blackberries, pumpkin, sweet potato and walnuts. Cooked pumpkin and winter squash is a healthy, wholesome warming treat to feed to your pet in the winter months. It also helps with digestive ailments! Another great treat in small amounts is organ meat. Ancestors of our furry friends would eat whole prey, which included a good amount of organ meat. Full in vitamins, minerals and micronutrients, I personally believe that this should be included in the daily diet of all dogs and cats in small quantities for optimal health. And now it is so easy! Tons of companies are making dehydrated and freeze dried organ meat treats like Bocce’s Bakery and Just Food For Dogs (just two brands I use in my patients for treats during acupuncture appointments and they can be found at your local pet store). 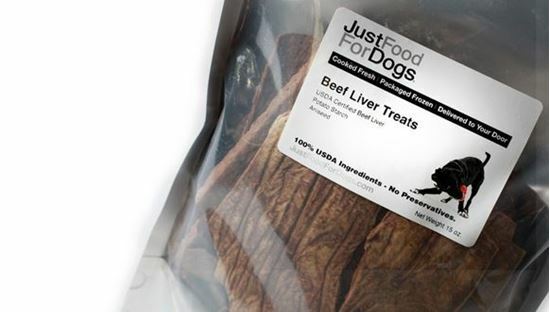 Organ meat based treats are a wonderful addition to our pet's diets! I hope you found this helpful and that you will start to think of fresh fruits, veggies and organ meats when you think about what treats to give to your dog or cat!